Are we all born with innate self-esteem that erodes over time or is self-esteem something we were supposed to pick up along the way? I found this question quite interesting when I stumbled upon it. Where I found it, it was quoted by Oprah but I am not really sure if it is her that first posed this question. Yesterday while driving to my second job I started to think about babies and toddlers and how much they really know when they are so young (0-2). I was wondering if we are all born with certain abilities that just need to be developed through experience. Life is complex and I have noticed (through working with so many young children) that there are things that they almost naturally know. How do babies understand certain concepts without even having it explained to them and although verbal expression takes time, I have wondered many times what children at these ages were truly thinking. They understand the concept of pain and know that it is a bad thing because their automatic reaction is to cry….this was never explained to them. I find that absolutely fascinating. So, in thinking about all of this, self-esteem is also one of those complex things. Throughout life I struggled with my self-esteem and I can say with all honesty I have NEVER felt 100% confident. I am more confident now at the age of 33 than I have been in my whole life but I still have minor struggled and self-image/self-esteem quirks to work out. I believe I struggled with self-esteem issues throughout my entire life because of everything that has been thrown in my face and what I have learned through environmental interactions. I wonder though, we watch children and they have moments of crying or whining but overall children are happy and seem so naïve to the world’s problems. Their innocence allows them to love everything in the world including themselves because it would appear that there is no other way of thinking or being. So, does this mean that our self-esteem deteriorates over time? The more we start understanding the world the more we start finding our own flaws because of the way we compare ourselves to others? Does our self-esteem start to come into question when we start learning about the ideas of right and wrong? It is obvious that I don’t really have a solid opinion on this topic because of all of the questions I keep asking. I just keep having these flashbacks of my younger years and being in elementary school with a bunch of different kids with all different backgrounds. I see the deterioration of self-esteem starting at these young ages because some kids were smarter and acted cocky due to this and popularity status started going into full-effect. I remember as a young girl being around other young girls in my class and getting a sense that they felt better than me. It was something I did not understand but their attitudes were different than mine (at least that what it seemed). I was not good enough, smart enough, pretty enough, etc. Don’t get me wrong, I had a lot of friends but among a lot of kids there was always a struggle to fit in somewhere. Trying to fit in and being rejected can be a real blow to one’s self-esteem. So, this started at very early ages. I keep thinking that the “popular” kids with the “better than everyone else” attitude had to be learning those actions from home. It had to have been being fed into their heads. I don’t believe a parent would act in that manner without there being a circumstance that caused it. At what age and under what conditions did this parent start to act in a “better than everyone else” manner. The same could go for the parent and child that struggles with self-esteem and self-image. I guess my question is, where and why did this cycle start? Did it form when media started to blow up? Why do so many men have an attraction to thin girls when the average girl is a size 12-14? Have we became brainwashed as a society and who is behind this brainwashing…I mean the absolute first culprit…it had to start somewhere right? Yes, I read into a lot of things…I find so much interest in doing so. I will most likely never get solid answers but only opinions because honestly, I am unsure of what truth really is??? A strong part of me believes that we are all born with an innate positive self-esteem and over time we are given the challenge of maintaining it. Unfortunately many of us are unable to maintain it to its full extent. 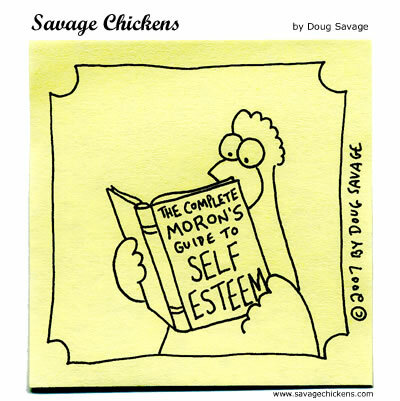 Self-esteem is a life-long lesson…something that must be worked on continually throughout life. Even those that appear to be completely confident sometimes can have their inner demons and mask those by showing “false” confidence. I believe there is a big difference between having positive self-esteem and believing you have positive self-esteem. One is a feeling and one is a thought and in my opinion the feeling is the only possibility of being right. The feeling is in the NOW! What a complex question… for me, self esteem has been a learning process.. I think I might of had it being born but it was quickly squashed inadvertantly (parents) and advertantly (other kids). However, as a middle-aged adult I’ve finally come into my own… and my esteem is pretty good these days, infact I’m finally at a point where (most) things that used to bother or hurt me from the past don’t have any bearing at all. I think we can keep it from deteriorating if we continue to try and have successes in whatever we do in life. I first noticed your article because of the wonderful cartoon I saw, which reflected exactly what I feel about self esteem. To me, this campaign seems to be directed at the wrong problem, unhelpful… in fact damaging to those people who suffer from insecurity… even more damaging to young people, students in school. It is designed to make the child or student feel better. I am an old man, and there have been times when I fit in… and a lot more times when I didn’t. The more I learned, the more I realized how much I didn’t know. I preferred to find other people that I could esteem, and the less I thought about myself, the better. I don’t have a lot of mirrors around the house, to waste my time looking at myself. I found I really don’t have to congratulate myself a lot in order to feel good. I feel much better, when I find other people to inspire me and teach me things. Self respect seems a lot easier to reach than esteem, and I think it’s more gratifying. Great post. Great questions. I don’t know how self-esteem works as an innate function, but if you ever read any of Dr Jean Kilbourne’s work or see her presentations, you get a feel for how cultures frame our perceptions of ourselves, our actions, and the world around us- and how we compare ourselves to such standards. She focuses on media portrayal, but I feel as though the media is essentially a mirror representing what we think we should be seeing, and it then becomes such a distorted caricature of that initial image or idea. In any case, I’m on the side of “Nurture” for this line of thought, with maybe a little bit of a natural predisposition to a position on a spectrum ranging from of “resilience” to “anxiety”. Thanks for posting that! Like you, I’ve never felt 100% confident, even though I have achieved most of the things I wanted to do in life (education, husband, child, house, job). I think it all goes back to your early experiences in life and whether you were praised or critisized by those around your (family, friends, teachers). Quite often we are knocked out of our confidence, especially if we compare ourselves to other people we deem better than us, either physically better looking or intellectually more intelligent. One must look at one’s own achievements and accept that we do what we possibly can to get ahead in life and if we have done our best, that should be good enough. In June I wrote a post that I believe sums up my feelings on when self-esteem starts and that in one sentence is “Kind and encouraging words starting with our kids”. Your post is good and really makes good points and I think shows that so many do struggle a bit with this issue. I do believe we have to start from the start making our kids believe in themselves because I do believe what you are told from the start is a lot of what you believe. If you are taught from the beginning you are wonderful the way you are in most cases I believe you will believe that. Some kids are told good things and still don’t have it but on the most part if you grow up believing you are good enough and can do anything you believe it or at least have the tools to work on it. Now things can happen to change it but if you have that background you usually have more confidence. When you are told you are not good enough that is what you believe and it can cause a life time struggle. That is only my thought on it but I have worked with enough kids to see the ones who are told they can acheive anything and are wonderful at least have the tools to be confident. It is something I know I have been working on for a long time. Great post and thoughts. Thank you for sharing..